Great NonProfits is like the Angie’s List for Nonprofit organizations. Organizations are reviewed by consumers, employees, volunteers, and donors. It’s that simple. We love it! The Top-Rated event for 2013 ends in October, if you have not yet left your comment, and rated The Dog Liberator, please do so to help our voice be heard and bump us up! This just in: Your supporters have spoken, and you’ve earned a spot on the 2013 Top Rated List! “Dog Liberator Inc.” is one of the first nonprofits to be honored this year and you are now listed as a winner on our leaderboard. 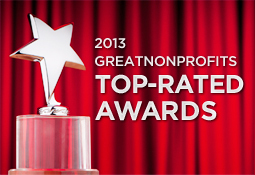 You’ll be featured on our site, our 2013 Top-Rated List, and distributed to media and corporate foundations. Visit our page on Great Nonprofits! Congratulations, Gisele and ALL other dedicated TDL people on this honor! You absolutely deserve to be singled out as the outstanding organization you are.